Individually designed front doors cannot only be seen as an entry to ‘any’ building, they really tell us a lot about the owner’s aesthetical conception and style preferences for his dream home. But of course, they also should reveal high performances regarding security, heat and noise insulation for your best comfort. Front doors give the very first impression of a construction and stand for the results of nowadays’ research into advanced mechanical systems for joinery. 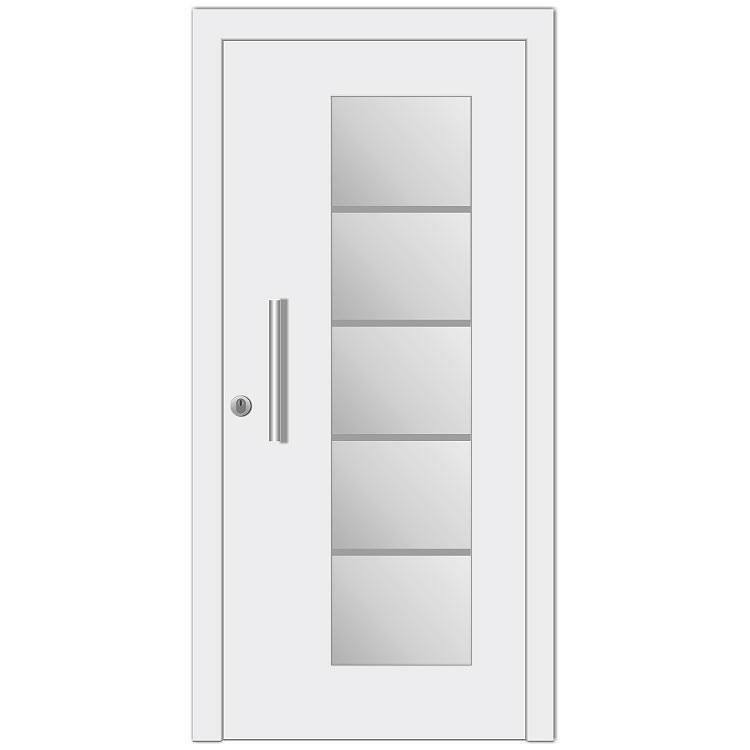 On windows24.com, you cannot only create and design your own front door style, but also complement it with any element needed. Vinyl (uPVC) has excellent thermal insulation qualities. The price-performance ratio when compared to other materials is also unbeatable. Plastic uPVC profiles can even be supplied in a wood look if desired. Woods such as pine, Meranti, larch and oak are all available and can be finished in a number of different paint colors to suit your personal taste. The surfaces have been specially finished to guarantee a long life. Aluminum as a material, has many excellent properties. Moreover, it makes high-class, exclusive surface finishing possible and is virtually maintenance-free. To create that colorful look there are a wide range of color options available. 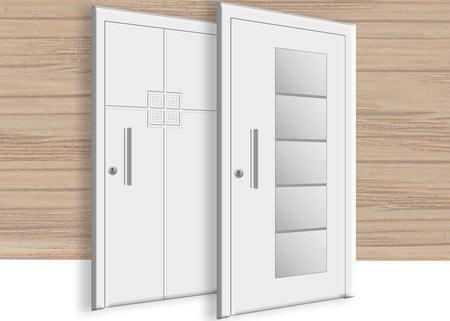 All our front doors are manufactured in Germany using the most modern manufacturing processes. Producing consistent high quality is one of the areas where we place great value, and have done continually since our company was founded in 1872. In order to be able to plan a front door exactly it is obviously important to have the right measurements first. The second step – choosing the material - is, however, a mix between a matter of taste and the specific purpose the door will later serve and the requirements it must fulfill. Materials available here are wood, aluminium and uPVC, all of which have unique properties which can be exploited for specific purposes. Although design in the form of colour is no longer a problem today, thanks to the special coating techniques which mean even uPVC is no problem anymore, the final look of the product is a very important criterium. Combinations of various materials are also available, as are glass panels or modern handles all of which help to make for an unusual and personal front door design. As well as the final look there are a few other features to keep in mind when looking for that perfect front door. For example, the particular material chosen may require a little more care and attention. Front doors should offer a suitable level of security, be well-insulated and long-lasting. The long life of the product is ensured thanks to the use of the best quality materials and components at Windows24.com. The front door of any house is its calling card – it should be seen as representing the house itself. The right kind of care and attention is of paramount importance to wooden doors. This natural material, which shines with excellent insulating qualities and robust stability, can be made stylish with the addition of the right coating which, in turn, benefits its weatherproofing features. Just the natural character and the warm look that products of wood automatically possess makes any extra effort required in their care and maintenance well worth while in order to prolong their durability. Another convenient feature is the ease with which this material can be processed. Wood as a base material is very pliable and malleable and can be decorated or painted very easily making it an ideal working material for doors and windows. In this way, every front door can become an individual and unique piece. 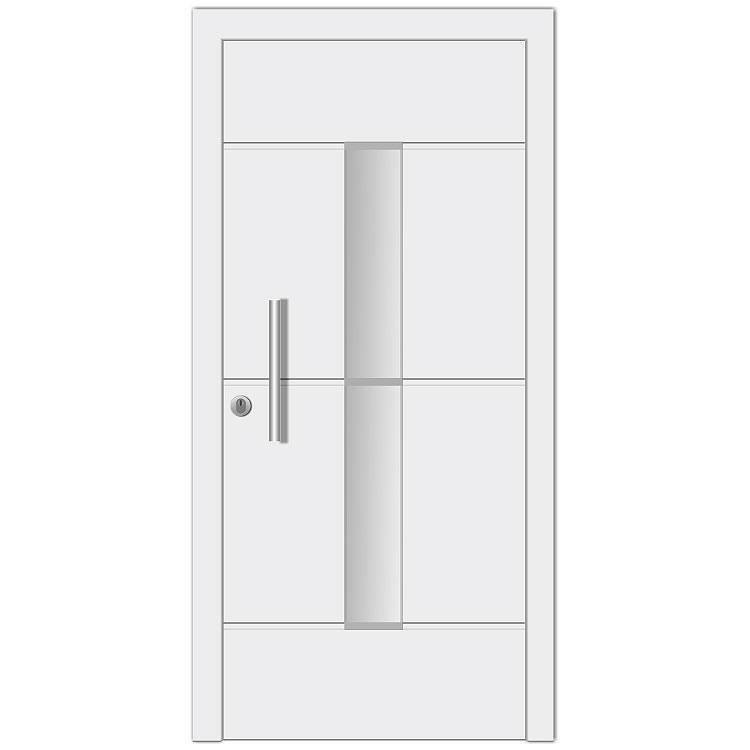 The front doors available from Windows24.com are, as you would expect, manufactured only from first class grades of wood, and these are given a special coating before leaving our factory so they are weatherproof when delivered to your door. Any colouring added uses a special acrylic-paint; this is available in a variety of colours suited for wooden doors and we also offer a wide selection of other features. At your disposal are models which have a more classic design but also those with a more modern touch. 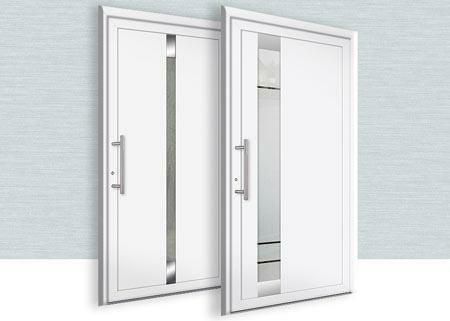 Doors can be chosen with or without glass panels and these can be in or at the side of the door. The actual arrangement of any gazing chosen is freely designable and depends more on your taste than limited selection with many different glass types to choose. 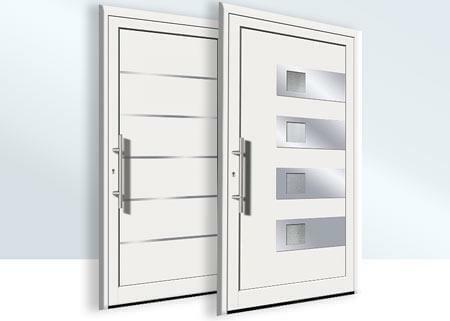 The individual creative possibilities when it comes to design and the inclusion of glass panels are virtually unlimited for wooden and aluminium front doors. 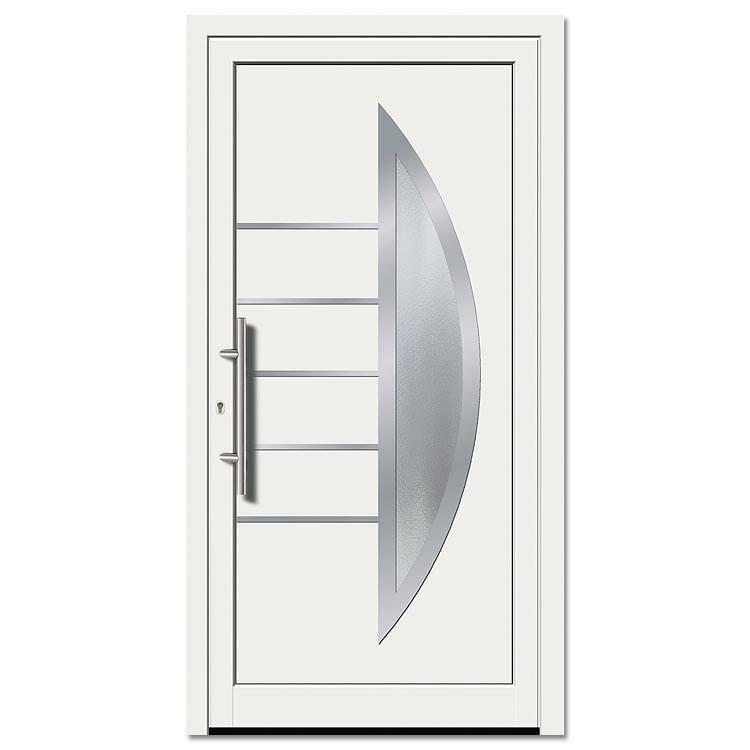 Modern technology mean that today’s doors of aluminium or of uPVC need no longer forego the positive properties of wood and these doors too can impress while requiring little care and attention. Doors and windows of uPVC can attain, for example, the best values in the category thermal insulation and their robust qualities which reliably protect from wind and weather shine through. 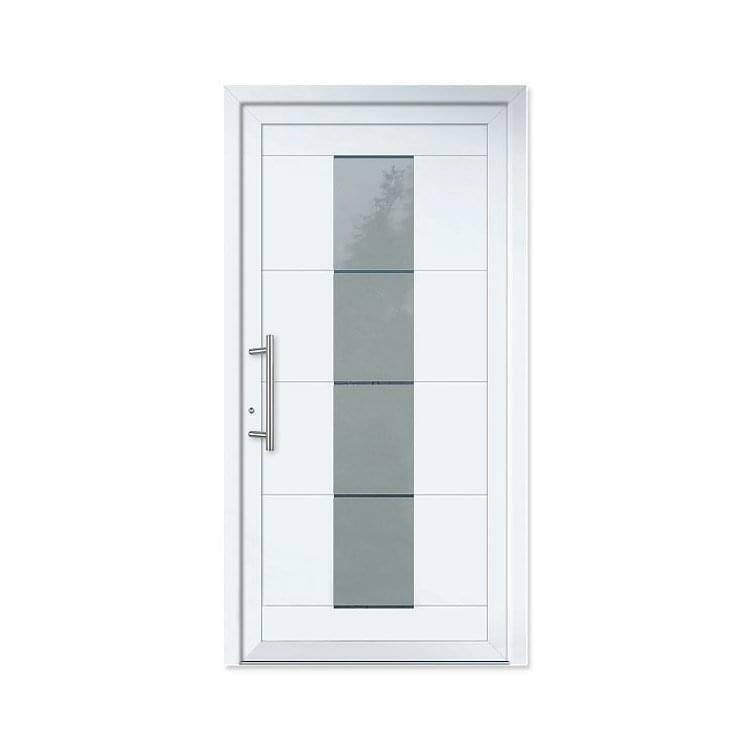 Our range of door (and window) profiles offers a variety of differing numbers of chambers all of which can improve the thermal insulation qualities of the uPVC door; and in combination with suitable glazing house doors can be created which fulfill the requirements expected of today’s ultra-modern passive houses. Energy saving has never been so easy. Aluminium on the other hand can, thanks again to special profiles, balance any possible handicaps arising from the material by its thermal insulation properties. These are likewise constructed according to the multiple chamber principle and additionally sealed on the inside with foam filler. The stability of this ultra-light metal is also impressive and offers protection against the worst of the weather and the worst of undesired visitors. And, should one decide to have a canopy over the front door or have a porch, then both door and residents will be well and truly protected from the worst storms. This keeps rain and snow away from the front door, makes the house door more attractive and lets the tired home owner spend longer looking for the key without letting any rain into the house itself. Furthermore, these prevent the formation of ice patches in front of one’s front door thus avoiding the risk of owner or guest slipping. With regard to the colour design, wood offers a wide range of possibilities, but uPVC and aluminium need no longer be painted in plain white or anthracite grey in today’s world. Specially developed coating techniques mean that these materials can be supplied in any of the colours included in the wide RAL-assortment. Front doors made in uPVC can also set a colourful accent to any facade or appeal – where requested – in a wood look. 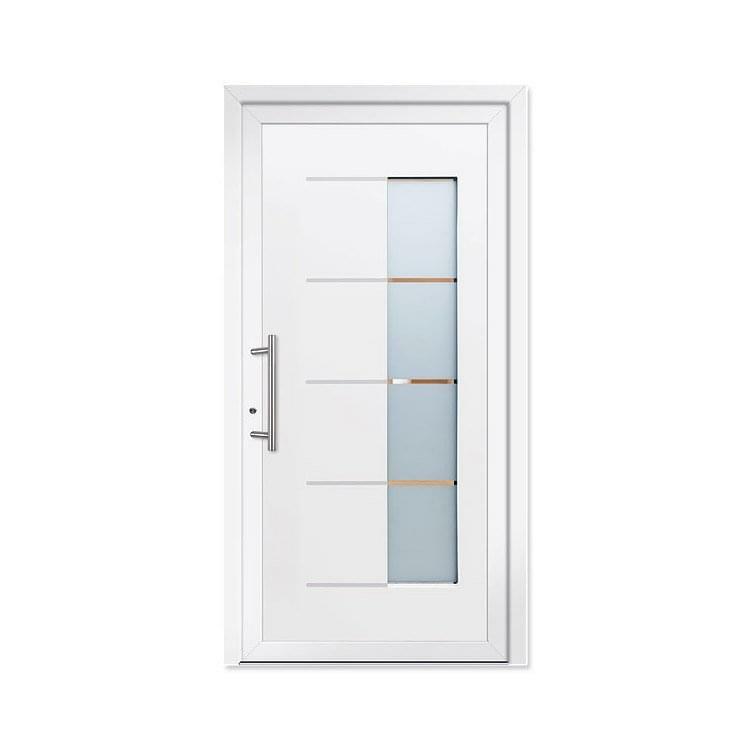 Glazing is part of the design as well as being an important component in the functionality of front doors. Depending on taste the decision in this respect may be for clear glass, ornament glazing or safety glass. This latter type consists of several sheets of glass which are joined together using a foil material. A combination of heat and pressure is used to bond this foil between the glass panes. The resulting glass ensures reduced risk of injury on the one hand and to increased burglar protection on the other. When broken the pane does not shatter into individual sharp-edged pieces and can only be penetrated with great difficulty. The good shock and impact resistance of this glass gives it excellent qualities for burglar protection. This effect is further supported by the tear-resistant foil between the glass panes, which effectively impedes any penetration eve of a broken pane. Frequently modern front doors today are found with a generous and spacious glass panel which lets natural light into the room behind the door, and may allow visibility into the street outside. Where privacy is required then the textured glass foil is a useful accessory. This has minimum effect on the amount of light which is allowed into the hallway, for example, but offers adequate privacy. One need neither forego a light and airy hall or entrance nor do without one’s privacy. The one-way foil or privacy foil allows privacy from outside, i.e. passers-by cannot look in, while allowing those within to look outside unhindered. Decor foils are very easy to apply to glass and offer not only privacy, but also – depending on the product and its actual features – an artistic eye catcher. The available handles and their combinations are also visually appealing. 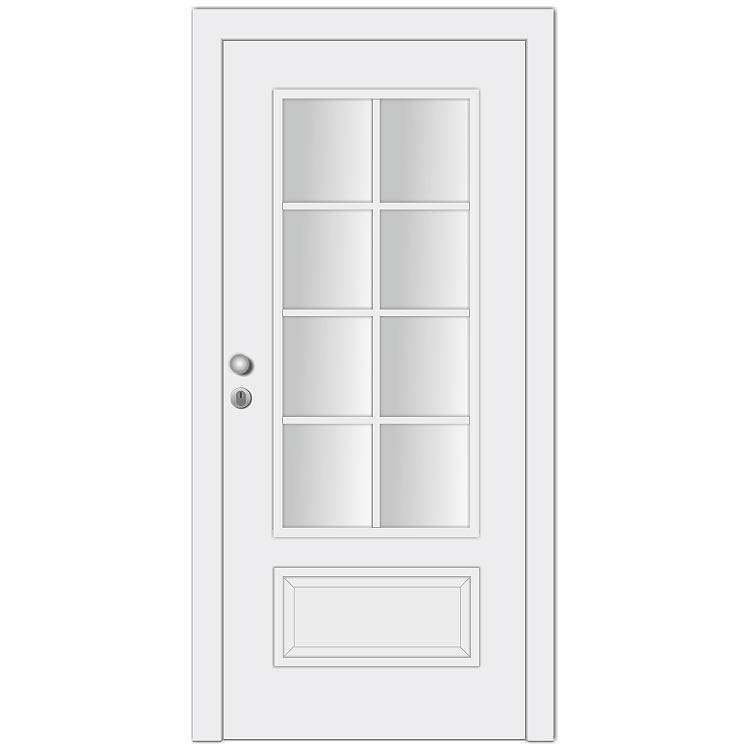 Obviously, the typical door has two handles: some form of grip on the outside to pull open and a handle on the inside to open and close. Both components are available in a variety of shapes and forms, which can be chosen to best co-ordinate with the front door according to personal taste. 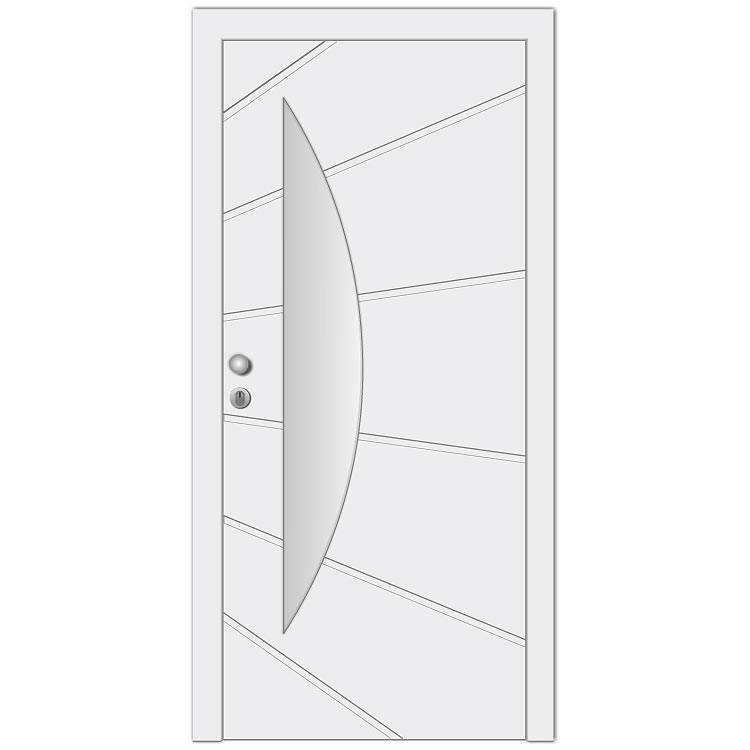 Very popular for the outside of the door are grips or bars of matt or polished stainless steel. Windows24.com offers a great variety in many forms: from straight bars to aesthetically curved models to suit your individual wishes. And the assortment includes simple rounded handles to those with a more angular design. A real classic is the round or cylindrical door knob, and we offer a fine assortment for the door of your choice ready for you. The indoor lever handle can be selected in a large number of different designs. Whether you are looking for a product with a rectangular backing plate or a simple handle with separate rosette: every wish can be satisfied through stylish and highly functional models. For all those who place particular value on safety and modern technology, biometric fingerprint opening and door locking with combination locks await. The added advantage of such systems – the door key cannot be lost! Only those whose fingerprint is saved or those who have the combination to the front door can gain access to the home. Although it must be admitted that the majority of break-ins in preceding years were effected via the window, one of the primary functions of a modern front door is to protect the safety of the house residents. Thanks to stable frame construction – partly reinforced with a steel core – and the opportunity to install impact-resistant glass, basic protection and a level of burglar-proofing is guaranteed. 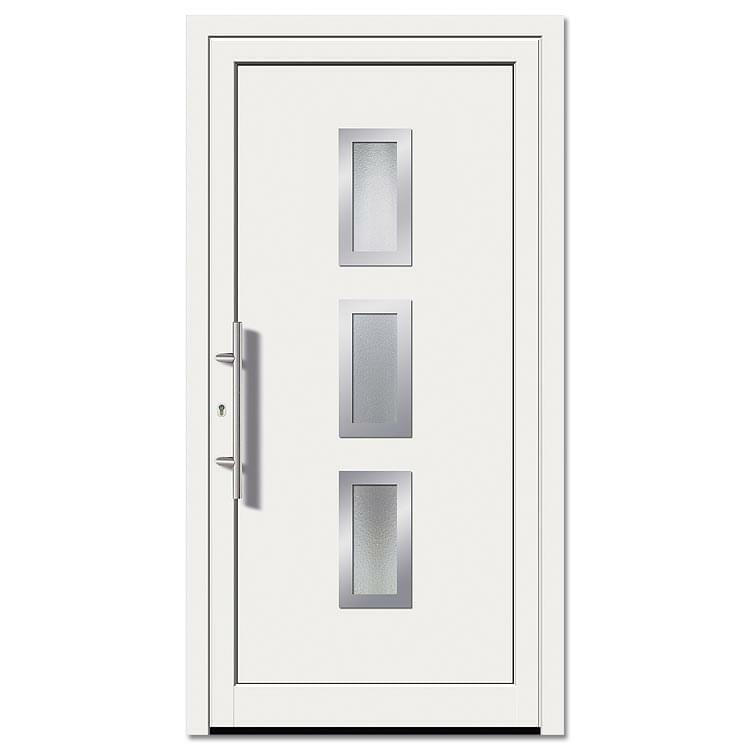 Those who wish to have improved safety measures for their front door or for side entrances fitted will opt for hinge side locking as well as a better class of locking. With the inclusion of these products security is guaranteed at all times of night and day. 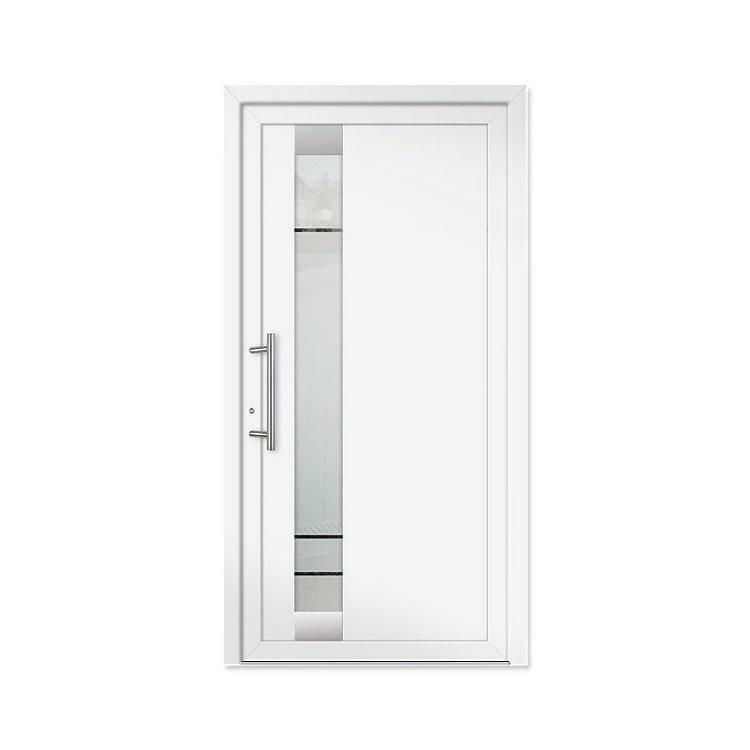 Hinge side locking ensures that the the door is not just secured at the main (key) lock but on both sides from any possible attack. A potential thief does not have to concentrate on the lock itself, as the door can simply be lifted out of its hinges. 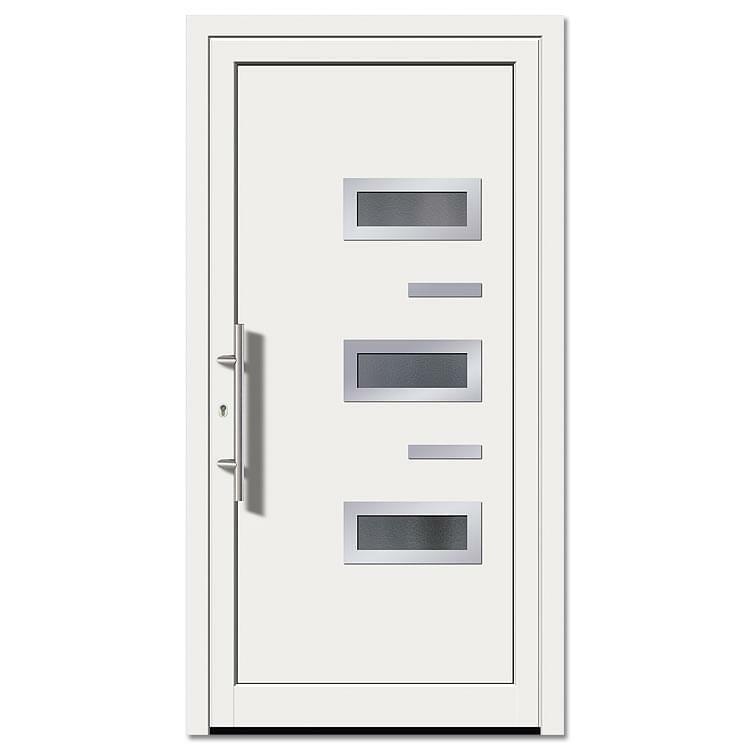 This levering can be prevented with the aid of locking systems whereby a robust hook is inserted into the hinge lock when the door is closed position. Although this hinge locking is a good anti-burglar safety measure in its own right one should not then be thrifty when it comes to the door lock itself. From 3-fold-claw locks to 7-fold locking systems with sliding bolt and even automatic locking with swivel bolt: everyone is sure to find the right locking system to meet their needs in this sector. The most ambitious burglar will bite their teeth in frustration and both life and possessions are optimally protected behind solid and burglar-proof doors. 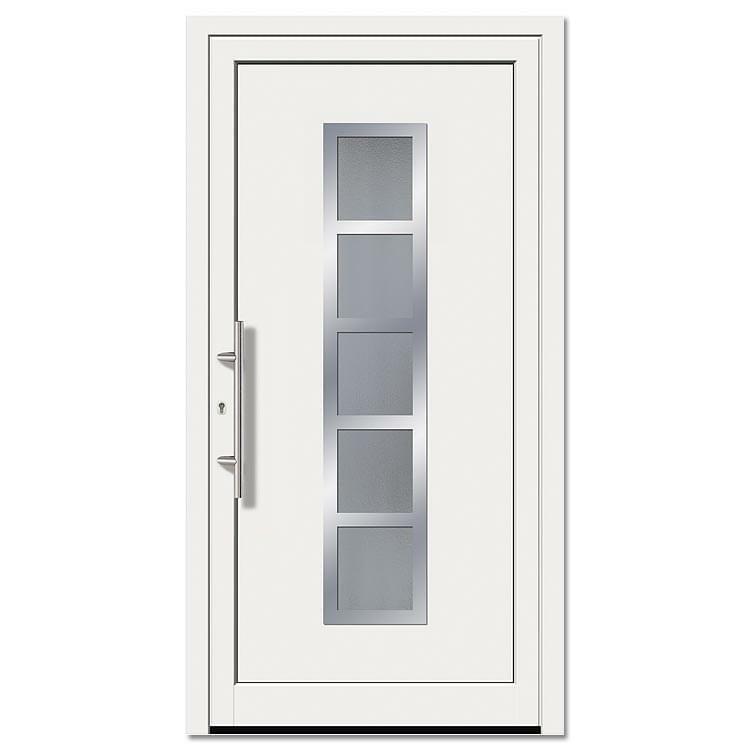 The front door configurator at Windows24.com brings the wide range of different models of the front doors on offer and their features into an easy to operate overview. Just by giving a few mouse clicks every requirement of the selected product can be individually added. 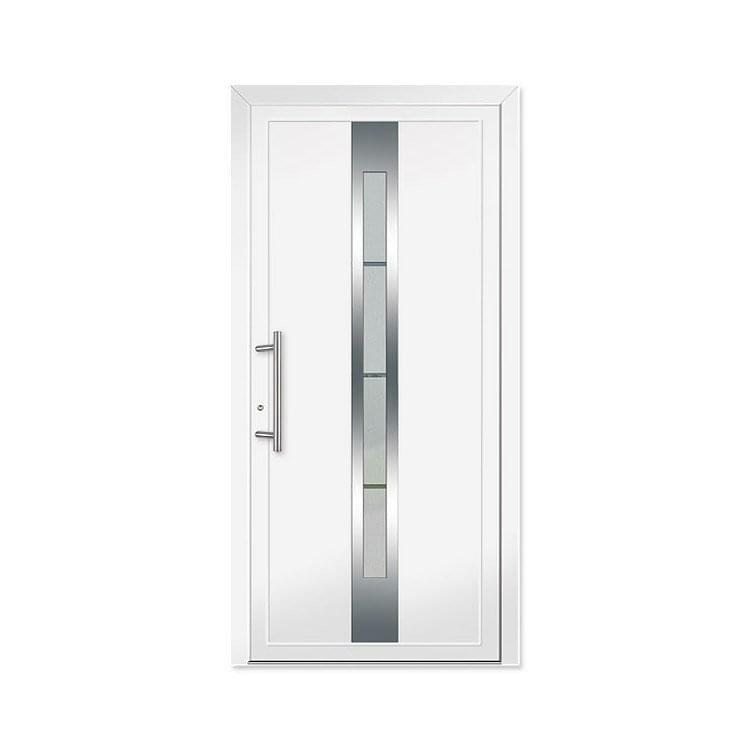 Beginning with the choice of the material – which will influence the later model selection – other features such as colour or the actual direction of front door rotation can be added individually to the chosen door. The models which are available are presented visually, so that any optical features added will automatically be updated and displayed and support your decision-making. A most important criterium when ordering a front door is, naturally, is having the right measurements. Height and width must be measured precisely before being entered into the appropriate boxes. These values dictate the total size of the completed front door and are visually depicted all through the order process. The following steps allow you to enter the required glazing, door hinges as well as locking system and handles. All of the elements selected are shown throughout, so that at all times an overview of the design and functional features of the front door are in view. Once the process has been completed it only takes one mouse click and the order is on its way.